Toy Fair has come and gone and now it's time to really delve into what was, or really what wasn't announced by Hasbro at the event. Their big reveals were the Bladebuilder lightsaber construction toys, the Chewbacca/Furby crossover, and the new hero mashers line. To see images of all the reveals, check out the official Hasbro gallery Jedi Temple Archives has posted on their Facebook page. Post by Jedi Temple Archives. (Ages 6 years & up/Approx. Retail Price: $79.99/Available: Fall 2015) For the first time ever, HASBRO is bringing FURBY to the world of STAR WARS with FURBACCA! This fully integrated toy and app speaks wookiee just like CHEWBACCA, hums theme songs from the STAR WARS movies, plays virtual games, and much more! 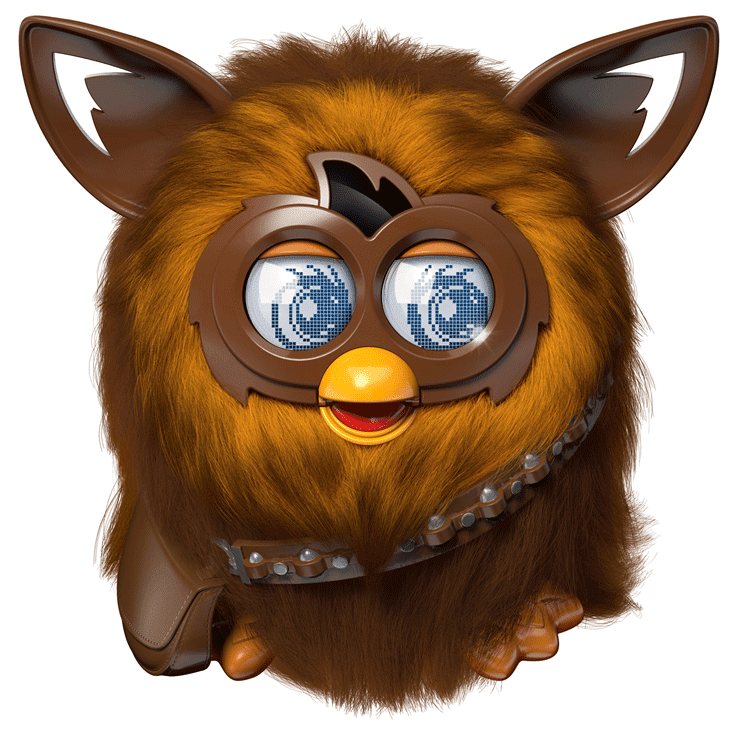 FURBACCA takes kids on a STAR WARS themed digital adventure via their mobile device as they explore the galaxy and collect virtual Star Wars FURBY FURBLINGS. The free FURBACCA app will be available for download in the App Store and Google Play in Fall 2015. The FURBACCA app is not required for FURBACCA play. Includes bandolier accessory. Requires four “AA” batteries, not included. But the really interesting stuff came from the Q&A JTA did with Hasbro representatives about the Star Wars brand. There were a lot of non-answers (due largely to the secrecy surrounding The Force Awakens), but I've picked out some of the highlights to feature bellow, but you can find the entire Q&A here. Q: Where are the action figures for the female characters from Rebels, like Hera, Sabine, or Maketh Tua? Male characters like Ezra and Kanan have been released multiple times already in many formats and scales, yet the best we've seen on shelves so far is a single Sabine with a non-removable helmet and a yet-to-be-released Hera, both of whom are packed with re-released Stormtroopers. Female characters have always played an integral role in the Star Wars saga, from Leia in the original trilogy to Padme in the prequels to Ahsoka and Asaaj in The Clone Wars and have always been among the first characters released in figure form, yet for this new chapter in the Saga, they've barely been a blip on the radar. A: Hasbro feels they have released plenty of female characters in the line. Q: With the port/shipping delays on the West Coast, are there any plans to re-ship Star Wars Rebels/Saga Legends figures from wave 1 to meet the demand? A: It’s not an issue of re-shipping. It’s an issue of getting out what’s already ready. Hasbro plans to keep supporting Rebels. Q: Does Hasbro plan to eliminate producing super articulation 3.75 inch figures altogether, or do they plan on reducing it for the line, for example, between 5-10 points of articulation, to keep the line cost effective and appease collectors? A: Hasbro plans to continue to supporting collector-focused figures. Q: With LEGO allowed to put out sets from the old non-canon "Legends" stories such as the Shadow Troopers pack based on 'The Force Unleashed', or Anakin's Starfighter from 'Clone Wars (2003/04), is it possible that we'll ever get action figures and the like from those stories, as well at some point? A: It’s possible. Hasbro was trying to stay within what Pablo Hidalgo (and others) had deemed that the cannon of Star Wars. But exceptions like these could open the window for other options in the future. Q: Do you have any plans to produce more 6-inch figures from "The Clone Wars"? A: Not right now, past Fall 2015, likely. Q: Hasbro.. I used to buy a figure or two every week. I haven't spent any money on your company since November last year. I am not interested in 6" or 5POA 3.75". I was going to collect the Rebels line but due to a lack of availability I have lost interest in them and have no desire to collect them now. I know I am not the only collector that feels this way. Are you concerned that you are losing customers by not having the abundance of SA 3.75" that you used to have? I'm pretty much done with collecting as it is in its current state. I only collect Star Wars figures and I am sick of seeing nothing but junky overpriced Command crap. Are you aware that in New Zealand a lot of retailers aren't even carrying figures now? A: Everyone will be happy Fall 2015. Q: Do you have plans to release a Star Wars Celebration Anaheim Exclusive? I have to say, this was a disappointing showing from Hasbro. Everyone was aware that The Force Awakens stuff was not allowed to be shown, but the lack of any other reveals was unexpected and disappointing. I'm also sad to hear that there will be no Hasbro Celebration Anaheim exclusive. The Furbacca also seems like a bizarre idea. I don't think many kids were crying out for that, but who knows maybe it will be this years must have toy (yeah right!). I hated the "deal with it" answers they gave. Especially the lack of female figures.